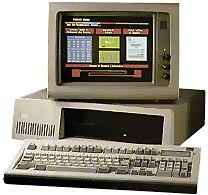 The IBM PC XT 286 is an intermediate computer between the IBM PC XT and the IBM PC AT. It had a very short career because most of its features can be found in the PC AT. Contrary to the PC XT, it has a saved clock and a calendar. Only a few were made-maybe 20,000. Someone with IBM told me that they stopped making them when they had used up all the XT boxes, since the new ATs used a different box. see more IBM PC XT 286 Ebay auctions !